The Royal Standard had a confusing number of address changes through the records of its existence, as seen above. Essentially it was on the corner of Wellington Street and Huish (which was renumbered during this period) but its main elevation and entrance faced Wellington Street. Thomas Locock was born about 1828 at Stoke sub Hamdon, about six miles west of Yeovil, the son of glover James Locock and his wife, Elizabeth. In the 1841 census Thomas was living with his parents and four sisters in Vicarage Street and, at the age of 13, was working as a glover. In October 1848 he married Martha Pike Hinton at Yeovil and in the 1861 census Thomas and Martha were living in Vicarage Street with their two daughters, Emily and Elizabeth. Thomas gave his occupation as glove cutter. In Kelly's Directory of 1866 Thomas was listed as a beer retailer in a London Road beerhouse. Unfortunately it is the only reference to the beerhouse, so its location cannot be located. Martha died in the summer of 1868 and Thomas remarried the following spring. By 1871 Thomas, his new wife Jane and his two daughters were living at the Royal Standard where Thomas was listed as glover and publican. Thomas remained publican of the Royal Standard until his death at the age of 67 at the beginning of 1895. Following his death Jane took over the license of the Royal Standard for a year or two. She died in 1899. John Henry Norman was born around 1854 and in the 1881 census was found living with his Yeovil-born wife, Eliza, and their young daughter, Beatrice, at the Duke of Wellington. John was listed as an innkeeper and coal merchant. By the time of the 1891 census John, now apparently known as Joseph, was running the Blue Ball Inn in Middle Street with Eliza and Beatrice plus a new baby son, Daniel. John / Joseph died between 1895 and 1898 by which time his widow, Eliza, was licensee of the Blue Ball. By 1900, however, Eliza had moved to Wellington Street and had taken over the license of this, the first Royal Standard, after the death of Jane Locock, who had assumed the license briefly after the death of her husband, Thomas. Eliza was listed as innkeeper in the 1901 census, living with her three sons; Rowland, Joseph and Daniel. She was last listed as the licensee in Whitby's Yeovil Almanack Advertiser of 1903. In the 1911 census Eliza was living at 16 Summerhouse Road with Rowland and Daniel. She died in the winter of 1931. After a couple of other brief tenancies, John Andrews was licensee from the beginning of the First World War in 1914 until his death in 1938. He too was superseded by his widow, Alice, for some ten years. The final licensee was H Walker who took over the license around 1949 and stayed until the Royal Standard was demolished in 1959 to make way for the Wellington flats development. The Royal Standard name was transferred to a new Royal Standard in Larkhill Road and the last licensee of this Royal Standard, Mr H Walker, became the landlord there. 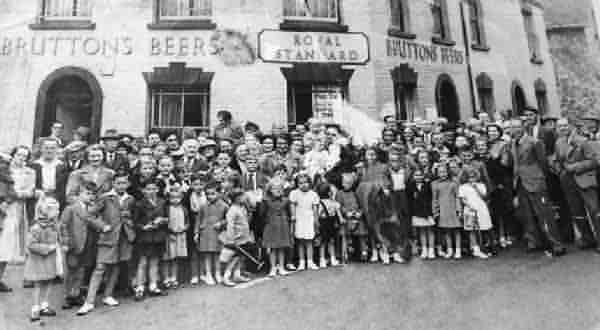 A crowd of regulars and their families congregate outside the Royal Standard in the 1950s - probably for a day excursion. 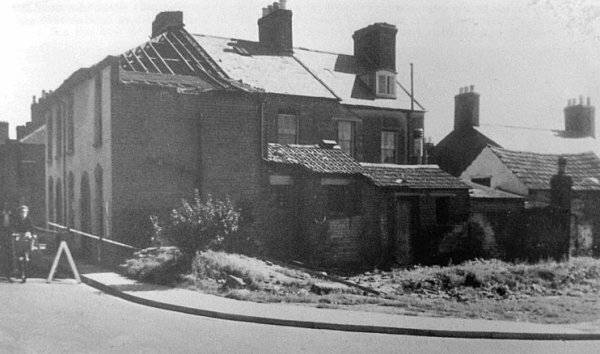 This photograph was taken at the beginning of demolition in 1959.